Neoterra is a fabulous community of contemporary eco-friendly townhomes located in Lake Claire. 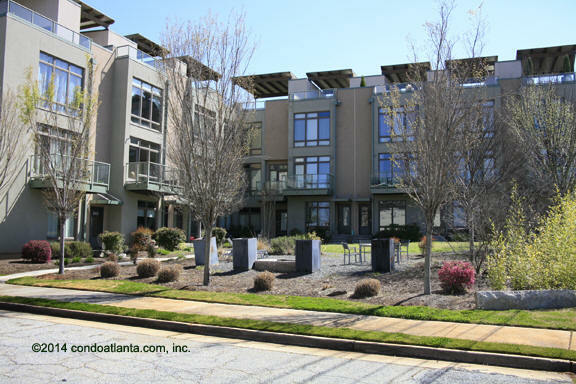 Homes feature rooftop gardens with stunning Atlanta skyline views, low-e glass for plenty of light without the heat, and sought after garage parking. Enjoy all the benefits of a home location a short drive to Lake Claire Park, Candler Park, Dellwood Park and Deepdene Park. Neoterra is also near Kirkwood, Edgewood, Oakhurst and Little Five Points L5P. Golf enthusiasts will appreciate easy access to the Druid Hills Golf Club. Community amenities include a common area greenspace with fire pit. Inman Park, Kirkwood, Candler Park and the Old Fourth Ward combine historic area neighborhoods and parks with easy access to the Heart of Modern Metropolitan Atlanta! Walking communities including the lovely development of lofts, condominium homes and townhomes, village style shops and eateries, fabulous art and music festivals are all part of the living landscape that make these areas sweet places for many residents to call home. Love living in lovely Lake Claire, a sought after Atlanta neighborhood known for an abundance of mature growth trees, beautiful greenspaces including Lake Claire Park, and easy access to Candler Park, Inman Park, Little Five Points L5P, Edgewood, and the City of Decatur!